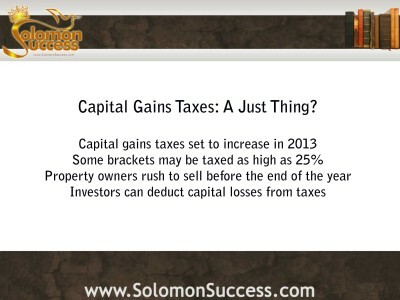 Solomon Success > Blog > Capital Gains Tax Rules: Benefits for Investors? According to Biblical accounts, King Solomon was a fair and just ruler whose decisions reflected the will of God, whom he quotes in Proverbs 8:15: “By me kings reign and lawmakers decree just things.” In today’s world, the ability of a lawmaker to decree just things is being questioned in the aftermath of the re-election of President Barack Obama. One issue raising concern among some taxpayers is the fate of the capital gains tax – set to increase – which could impact homeowners and real estate investors alike. ‘The capital gains tax is imposed on virtually all assets that are privately owned, including real estate. When a capital asset is sold, the difference between the amount paid for the asset and the amount for which it’s sold is either a capital gain, if money is made on the transaction, or a capital loss, if money is lost. While capital losses can benefit investment property owners, capital gains can be a tax liability – especially if the capital gains tax goes up, as promised by Obama’s second administration. Capital gains and losses can be classified as either short or long term, depending on the length of time an investment property is held before it’s sold. If a property is held for more than a year, it’s a long-term gain or loss; for less than a year, it’s considered short term. These two kinds of capital gains and losses are balanced against each other when the net gain is being calculated. Everyone must report capital gains on income taxes. The tax imposed on capital gains on real estate owned by investors and residential homeowners alike is generally lower than the tax rates that apply to other sources of income. But at the same time, the proposed increase to capital gains taxes may push the rate in some tax brackets to over 20 percent — and it’s this increase that has some property owners rushing to sell quickly before the new capital gains rates take effect. But within the framework of capital gains tax laws, investors gain a few benefits over those available to residential homeowners. Although both kinds of property owners must report all capital gains, only investment property owners can deduct capital losses on the property. Property owners who calculate a net capital loss in excess of the annual limit on capital loss deductions can carry over the excess to the next year’s tax deductions, treating it as if it was incurred in that year. Although changes may be looming for the structure of the capital gains tax, rest assured it is here to stay. But for income property investors following Jason Hartman’s investment strategies, the current law allows some benefit not available to residential property owners. Real estate investors see only that capital gains taxes are slated for a raise in the coming years of Obama’s presidency. But, as written, these laws offer benefits for investors as well as those owning a home for residential purposes.